The kids and I haven’t been fishing in roughly two years. My dear husband has gone several times. I’m not complaining, but it would be nice if we could have gone with him. Don’t get me wrong, I’m not one of those women that has her man on a leash or tells him he can’t hang out with the boys. I’m glad that he still spends time with his friends. He enjoys their company. Yesterday he went fishing with a long-time family friend. This friend does really well and is a fishing fanatic, in my opinion. There’s rarely a time this man gets skunked. However, last night was close to being one of those times; nothing he caught was worth keeping. On the flip side, dear hubby caught a decent Striped Bass (aka Striper). He enjoys the sport and also fishes to help feed our family. I’m proud of my hubby. Length: 34″ Weight: 16 lbs. 1 oz. Striped Bass caught from shore in Love Ladies, NJ. 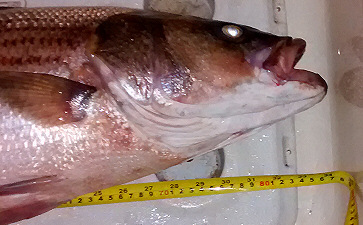 Before you ask, the bait used was a 6″ Hake that was caught earlier. Anything smaller or larger has to be released. Federal Government allows each state to decide on their own limits. Anything beyond 3 miles off shore is International Waters. Any fish caught are illegal to keep. you have a permit to keep a third fish. 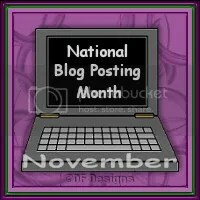 I found an interesting article while searching for links for this blog post.